Fees During the School Year (September through May) Payment of $76 per month is due in advance, on or before the date of the first lesson of each month. In months with 5 lessons, the 5th lesson is included and does not cost extra. In case of illness, holidays or other conflicts, your fee is not refundable; however, you are encouraged to schedule a make-up lesson if there is an available opening in my schedule. Please understand that times for make-up lessons may not always be available, but I will do my best to accommodate. Please call, text or email me as soon as you know you’ll be missing a lesson, no later than noon on the day of your scheduled lesson. A make-up lesson will not be offered if notice is not given. If I have to cancel a lesson for any reason, you have the choice of coming to a make-up lesson or having the fee for that lesson refunded. There is a $10/month discount for students taking double lessons (hour lessons or twice per week) or for a second member of the same household taking lessons. Fees During the Summer (June through August) Lessons are given all year. To accommodate vacations and other time off during the summer months (including two weeks off for the teacher), the total fee for the three months will be equal to 2 months of your regular fee. (In other words, if your regular fee is $76/month, your total for the summer will be $152.) This fee is due either in full at the start of the summer or in two payments, one June and one July. If you choose to take the summer off, your spot is not guaranteed for the following fall. Practice Requirements Each student is expected to spend time practicing at least 5 days of every week. The recommended time is 15 to 20 minutes per day for young beginners and 30 minutes or more for older students. These time guidelines are just that – guidelines. The goal of practicing is to accomplish the assigned tasks. This may take more or less time in any given week. Parents of younger students are expected to monitor and encourage practice time. I encourage older students to make notes when they practice of specific issues and questions that can then be discussed and worked on during lessons. In addition to practicing, some written work may be required, depending on each student’s progress and best learning style. After a student has spent time on lessons and written work, it’s great to do some “playing around” and/or sight reading. To help with practicing, students may visit my student blog at http://aplessons.wordpress.com where I post pieces we have recorded during lessons as well as warm-ups and exercises. 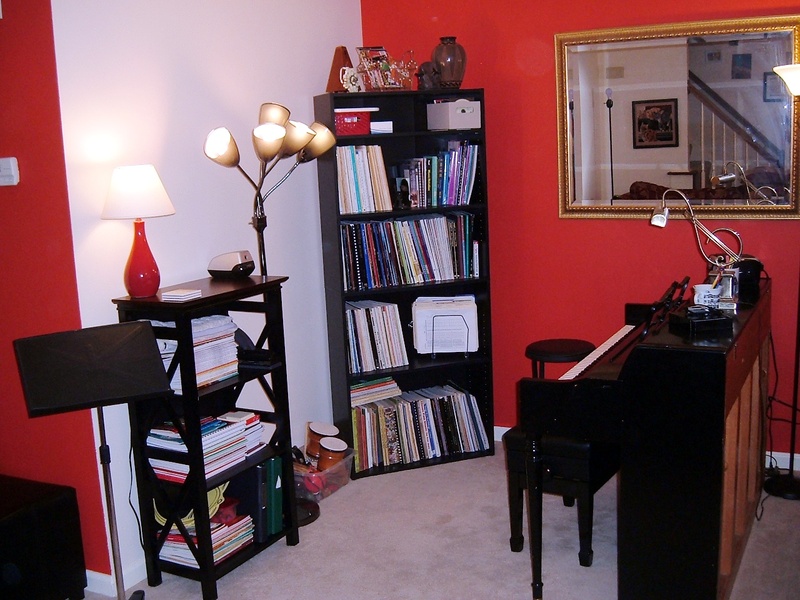 Materials Needed Piano/keyboard – Since practicing at home is an integral part of music lessons, piano students need to have a piano or keyboard at home. A piano is best, but I feel that an interested student should be able to take lessons even if he/she only has access to a keyboard. If a keyboard is used, make sure it has full-sized keys (preferably weighted) and an attachable foot pedal. Assignment book – Students will be given an assignment folder. Voice students may want to bring a notebook to write down their own notes. Lesson books – Piano students will need to purchase a set of books, which will need to be replaced at intervals anywhere from 3 to 18 months, depending upon the student’s progress. Voice students will usually be required to purchase books in two or three different genres; books appropriate to each singer will be selected after the first few weeks of lessons. Recording device – Students are welcomed, but not required, to bring an mp3 recorder (or cell phone) to lessons to record the entire lesson or parts of it. Other – Students may be asked to print out flashcards or staff paper as needed. Students are welcome to bring extra books or sheet music that interests them. Group Lessons Once every other month there will be group lessons instead of individual lessons. The students will perform for each other and do music learning activities together. Group lessons will be on your regular lesson evening from 6:30 to 7:30 PM. If you are unavailable on your regular night, you are welcome to attend a different night. A schedule will be distributed at the beginning of each school year so everyone may plan ahead.